You manage to create a sense of cloth animation in ASCII. - Anvil's second slot +/- buttons now increase the count much faster if dealing with more than 100 copies. - Increased max item level from 9 stars to 10 stars. - Optimized various item icons. - Moved the Mushroom Shop position (in-game) one tile down. - Exchanged impact VFX between XP Stone and Ki Stone. - You can now skip the XP dialog with Spacebar or Enter. - Added a "Stop" button to the "Open All" treasure dialog, so you may suspend the sequence in case of many treasures. - Rebalanced Grappling Hook: Damage from 2 to 3; cooldown from 20 to 16; stun duration from 0.8 to 0.6. - Improved Quarterstaff: Added attack speed scaling of 1 + 1/Lv; cast time reduced from 16 to 14. - Rebalanced treasure drop probabilities across all locations. - Treasure pickups are now limited to 150 in your inventory. - Fixed a bug where, if you added too many copies of an item to the Anvil's second slot, you'd get a malformed result. - Fixed a bug in the Ouroboros where it would sometimes loop to another location. 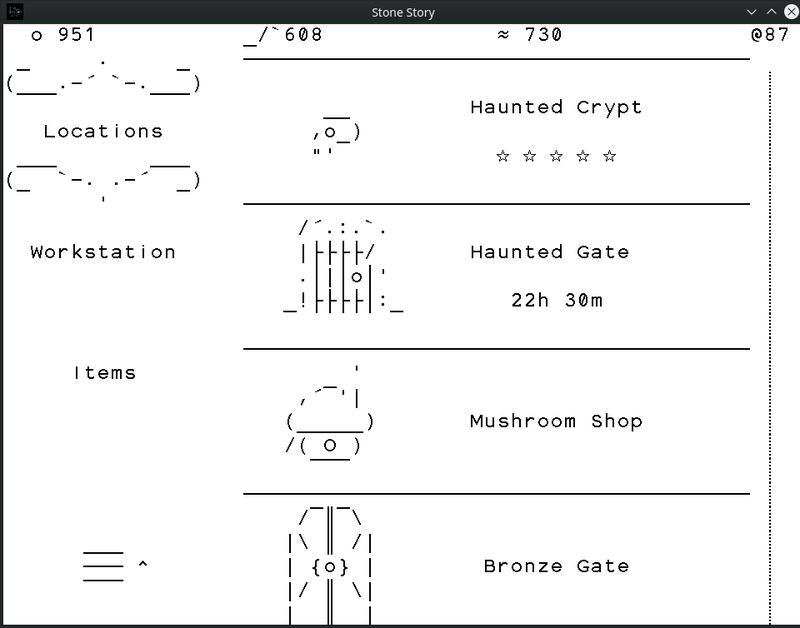 - Fixed a bug where the Haunted Crypt would not gain a star the first time you defeated Pallas. - Fixed the Quarterstaff pickup animation which had a 'o' at the tip, looking like a Stone Staff. - Fixed a bug where, after you craft an item you could see a double details dialog and the scanline could be out of place. - Fixed a bug where, after crafting, pressing 'x' would hide one window but reveals the new one anyway. - Fixed a minor problem where the music was not stopping after defeating Xyloalgus or Bolesh, difficulties 4 and 5. - Fixed a serious issue when trying to combine two high level items and it would sometimes produce bad results. - Fixed a minor issue in the Bronze Gate where you could spam ESC and it would keep transitioning. - Fixed a minor issue with the color of the level label in item slots. - Added scroll bar interactions. - Debuffs applied to characters now appear at the bottom, next to the hitpoints. - Adjusted Rocky Plateau ☆4 and ☆5 to be faster if you just want to talk to Dysangelos. - Reworked Bolesh to have weaker claws and stronger bite. Her bite now applies a damage debuff. - Scarabs are now immune to ranged weapons and their Hitpoints are reduced from 10 to 8. - Reduced Mosquito wake-up distance from 21 to 20. - Adjusted mosquito distributions in Deadwood Canyon☆3. - Fixed an issue where the Crafting Booklet was showing some items before you actually found them. - Fixed a minor issue when the Crafting Booklet is drawn on top of badge notifications. - Minor fix to the Crafting Booklet's first entry (item upgrade) for older players not playing from the beginning. Otherwise, working on combat mechanics. Trying to differentiate melee and ranged strategies more. Holy Ascii code table, that's amazing! I must play this game! Some shield designs.. since I am working on shields. Finally got to try out the beta on Linux. What's the VSync bug you are seeing ? Can't have a bunch of broken images, can we? Having the sight stone animation play again fixes it btw. The VSync bug is a notoriously underestimated Unity-on-Linux bug that affects 99% of all Unity games out there. For some reason, games that allow for explicitly setting VSync from within the game (Jazzpunk) or through a launcher (Mousecraft) seem unaffected). I guess you're also already familiar with the weird time-out bug? I happens with all boss fights for me except in the Caves of Fear. 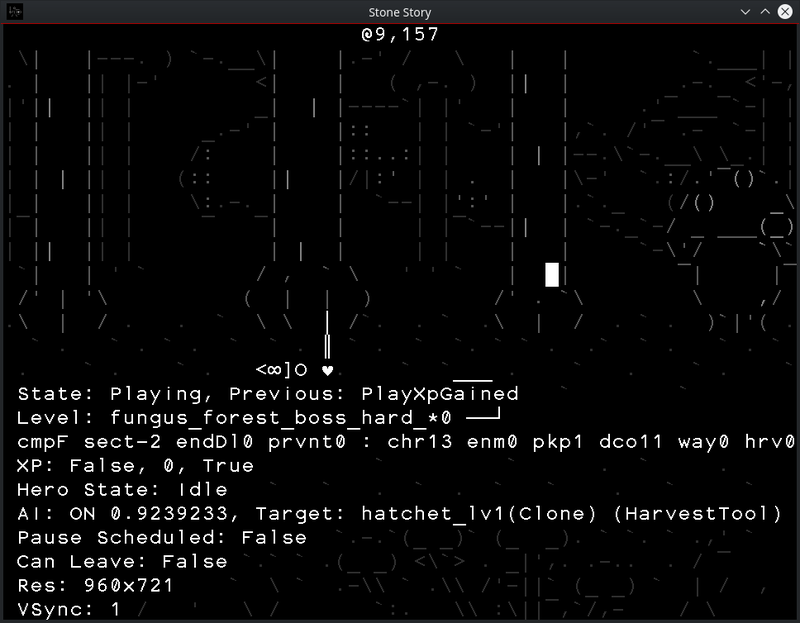 If I press TAB I can see that for some reason, Target becomes either the shovel or the hatchet (which seems to make no sense) and then there is a timer that takes like a minute to end before the player AI does something else again. Opening the inventory and swapping stuff out helps (utility belt doesn't). It can happen before the boss fight (tree), or after (mushroom). In the latter case it is especially annoying, because I can't open the inventory during that animation. Also, out of curiosity: why can't I load in 16 swords here? It would make the whole fusing process a lot faster. I'm glad to finally have some concrete info on the "timeout" bug. Strangely, it never happens to me. Will investigate that data soon. You can press V + 0 to disable VSync. V + 1 or 2 (double vblank) to enable again. Please try that out and see how the CPU reacts to each option. Currently it is not saving to preferences, but it will eventually and the options screen will have a button for VSync. 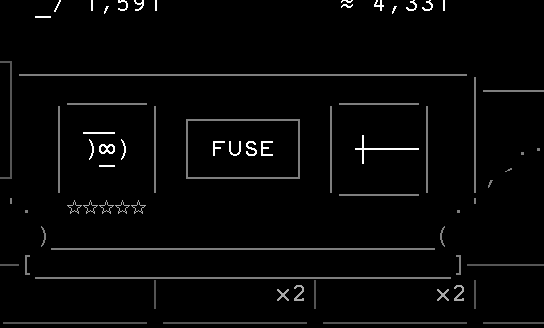 Regarding the Anvil +- buttons, the logic in that screen is so damn complicated that I've had to make some cuts just to get it bug-free. It's the perfect example of ridiculous algorithm which is invisible to the player. Wow, V+0 actually fixes it! Setting it back to V+1 or V+2 breaks it again. That's counter-intuitive. It sort of makes sense. The CPU has to be slowed down to match the monitor's frame rate. This is probably being done in a bad way on Linux by keeping the CPU busy... every frame. Thankfully tearing is not very visible in Stone Story. Perhaps the correct choice is to have VSync off by default on Linux. @JobLeonard if you get the timeout bug again, could you please observe the behavior of the decimal number next to "AI: ON" where it says 0.9239233. Does it keep changing? Or is it static? If you press and release Tab does the number ever change? If it does change, how so?